What if the measure of your success is only determined by how well you adapt to change, doubt, uncertainty and fear? What belief system must you possess to conquer those challenges? Only rare events force people to change. Even more rare are those individuals who can inspire people to the core and move them to action. tt Burrows’ riveting story of overcoming adversity through sheer determination, will power and goal setting is infectious. Scott played college football at Florida State University under coach Bobby Bowden and was a top-ranked kickboxing champion, having his last fight broadcast by ESPN. His future was filled with promise until November 3, 1984 when, at the age of 19, he was critically injured in a disastrous automobile accident and everything changed in the blink of an eye. Scott survived, but was paralyzed and diagnosed a quadriplegic. Despite this grim prognosis, he refused to be sidelined. He endured years of grueling physical therapy, learned to walk again with the aid of a cane, graduated from college and had a successful career in the insurance and financial industry—even qualifying for the Million Dollar Round Table (MDRT), a 100% commission-driven award that fewer than 8% of agents worldwide achieve yearly. Later, Scott became a world-class motivational speaker. 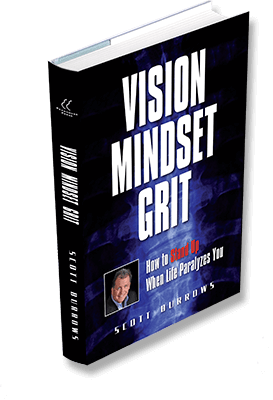 Vision, Mindset and Grit—three powerful words that describe Scott Burrows—will also inspire you to achieve your absolute best. This book is more than the story of Scott’s determination to overcome enormous obstacles and rebuild his life. It is a testament to his intention to inspire others and help them triumph over adversity as well. He has shared his message of hope and success with audiences throughout the world and motivated them to make positive changes in their own lives. Brent Stombaugh, President / CEO, Brookside Laboratories, Inc.